Bortolo Mutti has been handed the task of trying to lift Atalanta away from the Serie A relegation zone. (CNN) -- Struggling Serie A side Atalanta have appointed Bortolo Mutti as their new coach. The 55-year-old former Messina coach takes the place of Antonio Conte, who resigned last week after a poor run of results. Atalanta have mustered just one point in their last five games and lie 19th in the 20-team division on 13 points from 18 games, three points from safety. An official club statement read: "Atalanta announces that Bortolo Mutti will guide the first team and will be unveiled to the media." 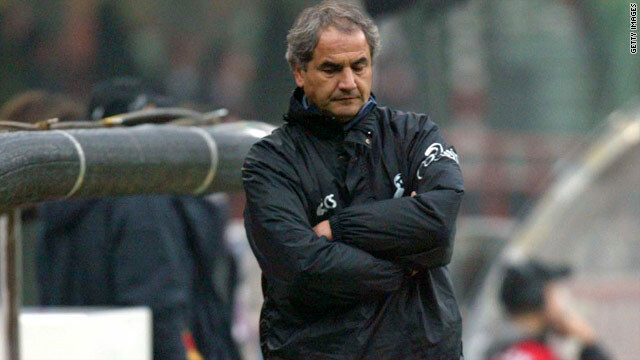 Mutti, who managed the Bergamaschi in the 1998-99 campaign, was out of a job since being sacked by second division Modena in 2008. Mutti's first game in charge will be at home to Lazio on Sunday. Meanwhile, Argentine forward Ezequiel Lavezzi has signed a contract extension with Napoli until June 2015. Lavezzi had been a reported target of Premier League clubs Chelsea and Liverpool over the last six months. He has struck three goals in 17 league appearances for Napoli, who currently lie fourth in Serie A. The 24-year-old joined Napoli two years ago from San Lorenzo and his previous deal was due to end in 2012.